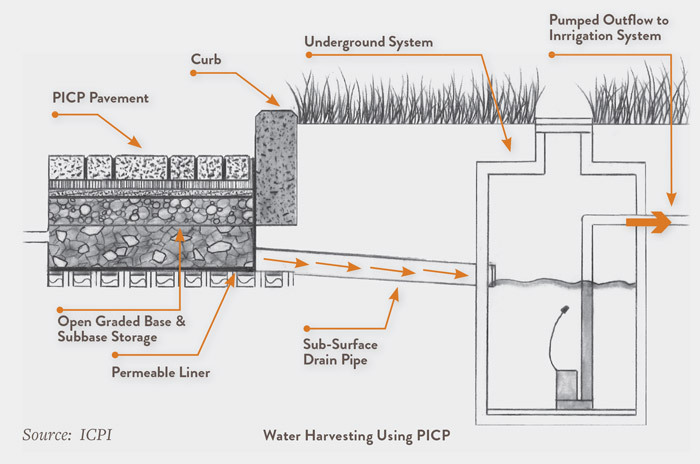 How Does a PICP Stormwater Runoff System Store Water? A PICP stormwater runoff system stores water by allowing stormwater runoff to infiltrate through porous surfaces into a storage reservoir. 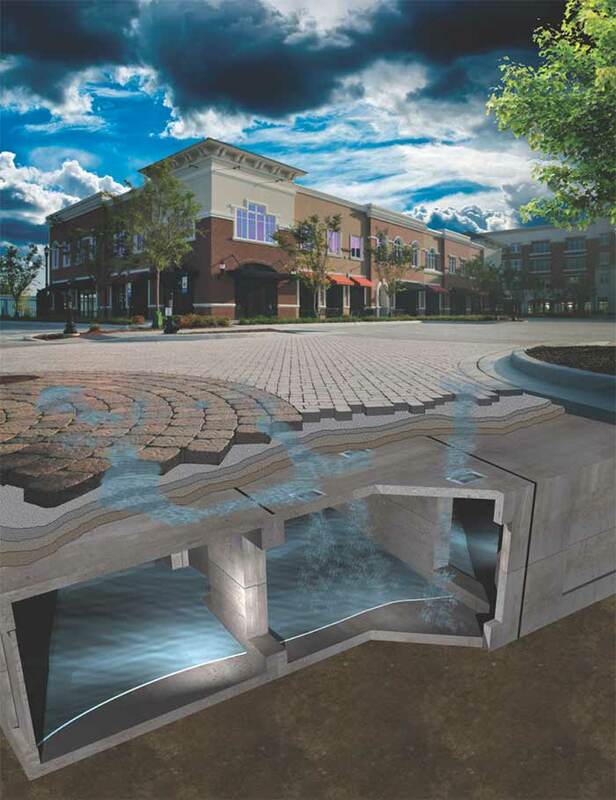 This method of stormwater runoff harvesting utilizes a free resource to reduce municipal water supply costs, while complying with regional stormwater management guidelines. In southern climates, a NO INFILTRATION system (complete with liner) can be used as the long term storage reservoir, with the water being used for irrigation, washing or other non-potable applications. An integrated control system, such as provided by Water Harvesting Solutions (www.wahaso.com) is typically used to operate these harvesting systems. In addition, where the PICP is also serving a stormwater management function, it is recommended that an active control system be used to monitor weather forecast information and to automatically draw down the water volume to accommodate projected precipitation rates. In certain applications, combining the benefits of PICP with the high volume detention/retention capabilities of StormCapture vaults provides rainwater collection solutions for challenging site conditions. 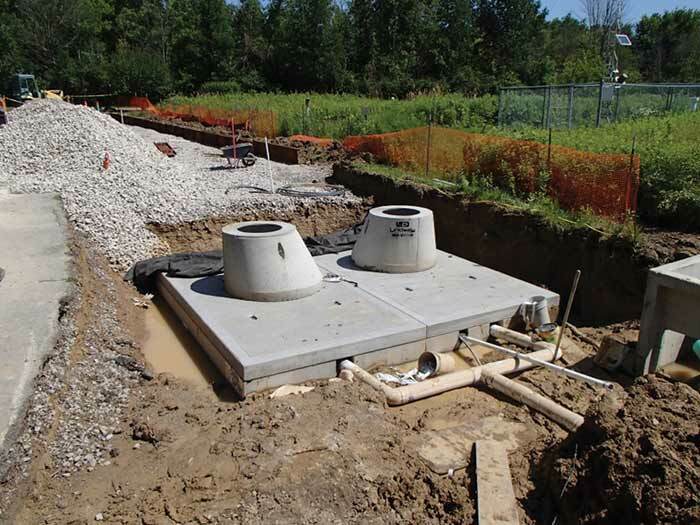 Examples of potential applications for PermeCapture include: coastal areas or sites with high water tables; poor or limited aggregate availability; poor soils, shallow rock, or excavation challenges; sites requiring access for inspection & maintenance of retention/detention water, or sites where aggregate water storage is not recognized or credited. The need to maintain an aesthetic surface is another reason to utilize this type of system. PermeCapture vaults are H-20 rated, and include HydraPorts to allow water from the PICP system to drain into the storage chambers. When used as a retention system, treatment benefits of PICP rainwater harvesting technology can be incorporated into the PermeCapture system.